Making candles for dark nights was a yearly chore in colonial households. While colonists often bought cotton wick, they typically made enough candles to last for the year. Candles were most commonly made by dipping during colonial times in households, especially during the early colonial period. However, candle makers, or chandlers, started using molds as well. Colonists would melt waxy material, usually tallow, in a large kettle full of scalding hot water. Once the tallow was melted, they would skim off the tallow and put it in another pot for dipping. They might also have put the tallow through a sieve to get out more impurities. They would then take a long wick (either bought from the store or spun from flax or cotton) and tie it to the end of a stick. Usually they would tie several wicks to one stick so they could dip several candles at once. Once the wick was tied, they would begin dipping the wick into the melted tallow. Once the candle was large enough, the candle maker (or wives and children) would press the bottom so it was flat and then hang the candles out to dry. The tallow had to be stirred regularly, and it took about 25 dippings for a whole candle. Because it was quite a process, colonists would set aside an entire day for this annual chore. 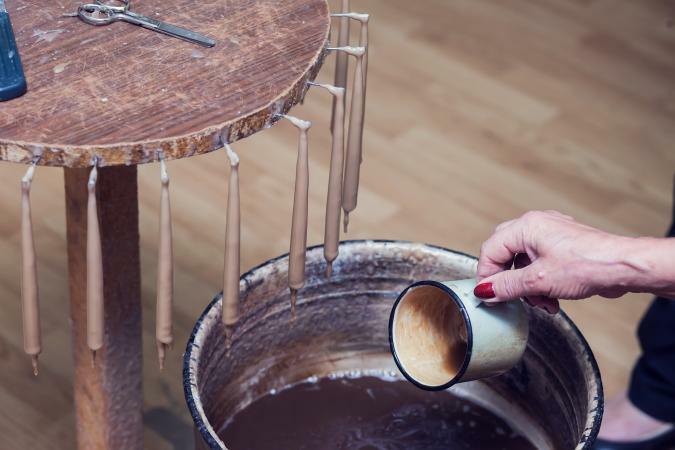 This process was the same regardless of the wax being used. The chandler would melt the wax material and skim off impurities. He would transfer the melted wax into something with a spout for easier pouring. He would then pour wax into the molds and allow it to harden. 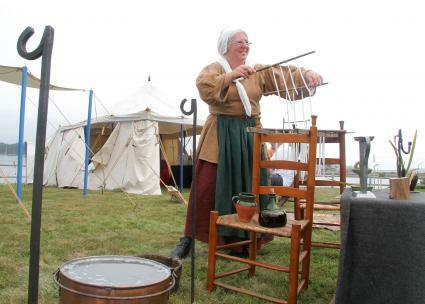 There were four materials that candles were primarily made from during colonial times. The vast majority of candles in colonial times were made from tallow, which is a hard, fatty animal substance. The best candles were rendered from half sheep and half beef tallow. While you can use any tallow, this combination smelled the least and burned the best without sputtering. Especially poor people might use pig tallow, but it was undesirable because of the smell. Beeswax was another popular material for candle making during the latter part of the colonial period. Beeswax, like bayberry, was not as plentiful as tallow, but it made a pleasant-smelling candle. They could be made either by dipping or in a mold. New Englanders discovered bayberries have a waxy substance and were great for candle making. Not only did bayberry candles smell better than tallow candles, but they also were naturally a lovely green, making them great for decorating. However, it took about a dozen pounds of bayberry to yield one pound of candle wax. Consequently, people tended to add bayberry to their tallow wax rather than just making candles exclusively out of bayberry. The first uniform candles were made from spermaceti, although chandlers did make molded candles from other materials. Molded candles were uniform in shape, so they looked nicer; however, spermaceti candles burned brighter and were firmer so they tended not to lose their shape. Chandlers made spermaceti candles by taking crystallized sperm whale oil and pouring it into candle molds and allowing it to harden. 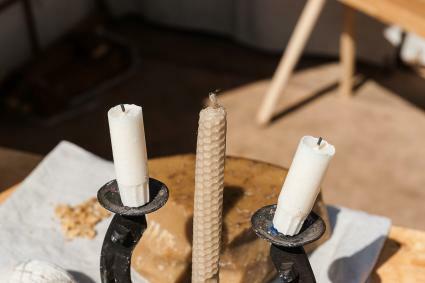 Colonists didn't necessarily have a lot to work with, so the equipment needed to make candles was kept to a bare minimum. Candles were an absolute necessity during colonial times because they were a primary way to light a home. Candle making was a common household chore until the oil lamp was invented and became common in the latter part of the 18th century. Even after the oil lamp came on the scene, colonists continued to make candles simply because they found them to be beautiful.